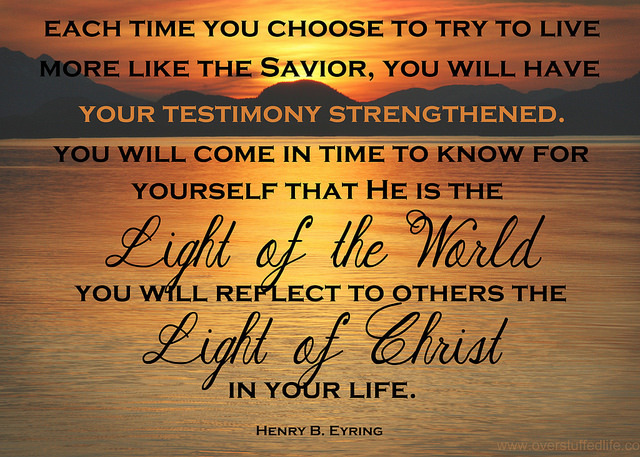 The March Visiting Teaching Message is The Divine Mission of Jesus Christ: Light of the World. Since the quote by President Eyring talks about reflecting the light of Christ in our own lives, I thought of a photo I took on an Alaskan cruise about 5 years ago. (You should really click on that link and see the original photo--I had to desaturate it a bit for this so the words would show up better.) It was the most breathtaking sunset I have ever seen in my entire life. The light of the sun reflecting on the water was like actual gold. I dug it up to use for this printable since the imagery of the sun reflecting on the water reminded me of reflecting the light of Christ.